A bodyguard dog is not just a dog – it is a highly intellectually developed animal, which protects its owner, his family members and their property! This DVD presents educational material on training a bodyguard dog in various situations, such as: protecting the owner at home, during walks, and in a vehicle. 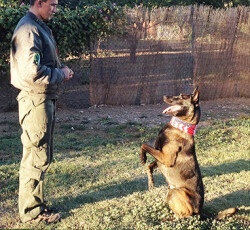 This DVD shows in detail the processes of development of defensive skills, as well as a demonstration of an already trained working bodyguard dog. This DVD reveals various attack scenarios, which will pleasantly surprise you and enrich your knowledge in the area of professional dog training.